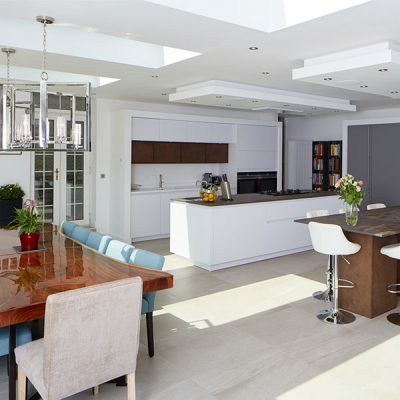 A KITCHEN WITH FUNCTIONAL ORIENTATION TOWARDS THE GARDEN THAT BLENDS INTO SURROUNDING RATHER THAN STEALING THE SHOW. 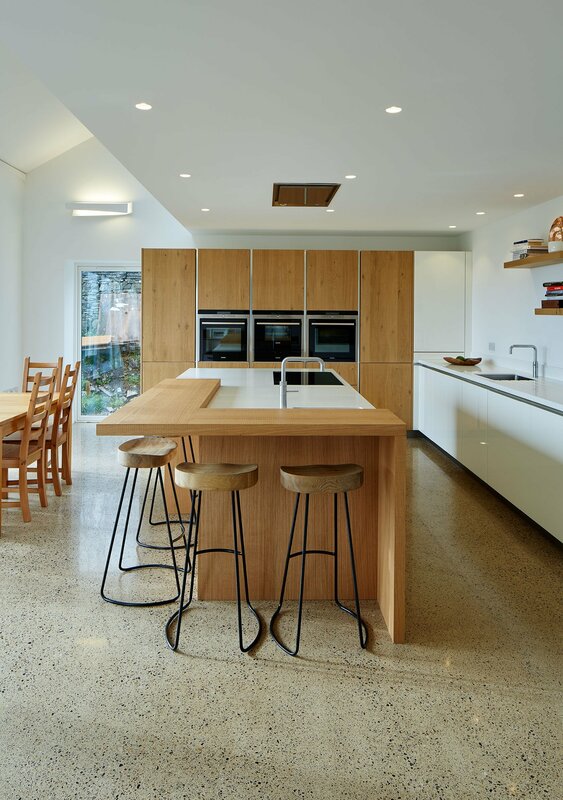 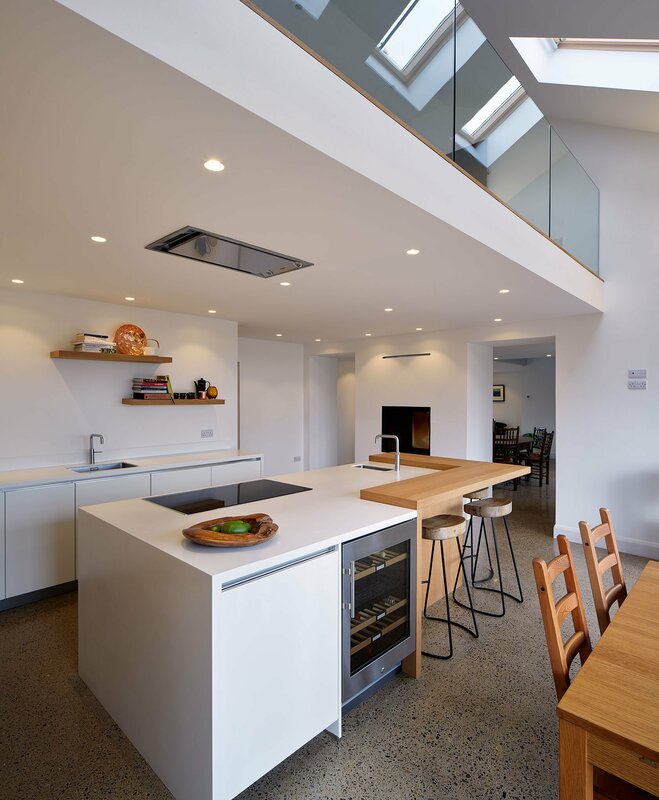 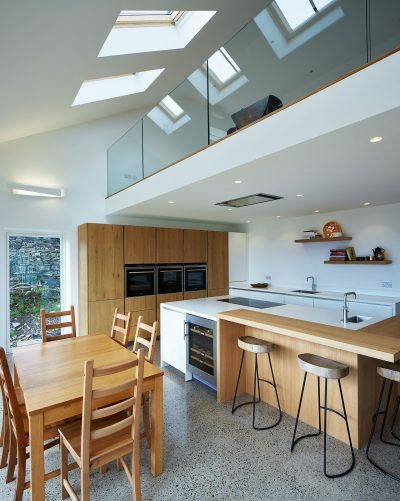 Set in a large space with polished concrete floors this kitchen compliments a stunning garden. The main requirements were to achieve a functional orientation towards the garden, whilst providing social seating for four people. 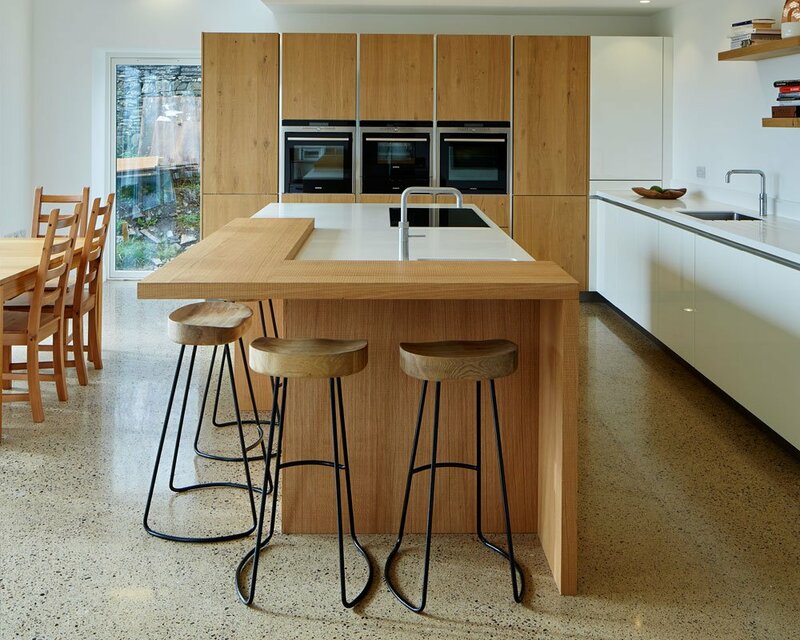 The seating should avoid the ‘piggy-in-the-middle’ feeling, often associated with the long line of bar stools across the back of an island. Set in a large space with polished concrete floors, mezzanine snug and large glazed doors, the kitchen needed to blend into its surroundings rather than to ‘steal the show’. 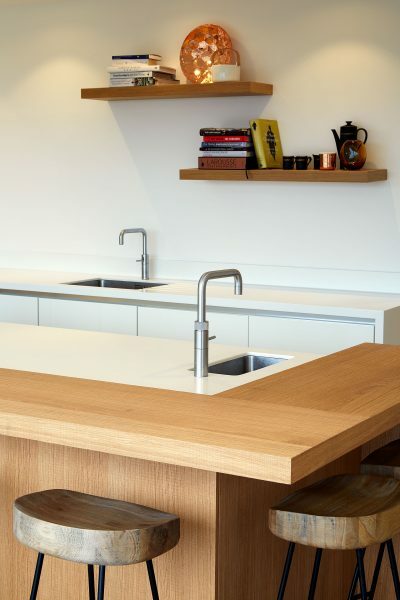 Key elements were to keep it light bright but welcoming, incorporating the warmth of rough-cut oak veneers with gloss lacquered white doors but not looking too much like a ‘typical kitchen’ hence we avoided wall units altogether, using minimal shelves to add further accents of oak. 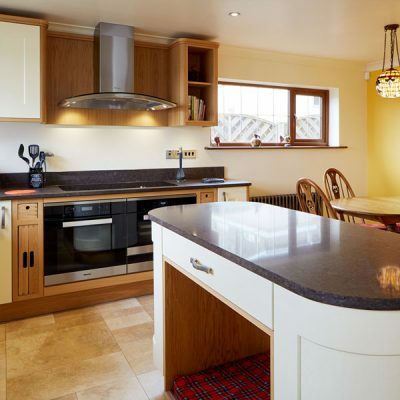 This is a well used family kitchen, so had to have a good range of appliances. 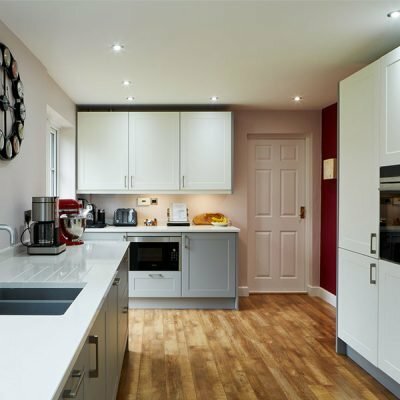 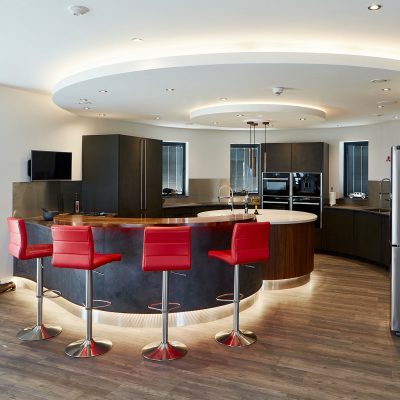 A large larder fridge and freezer, steam oven, combi- microwave, 2x single ovens and a boiling water tap were incorporated. 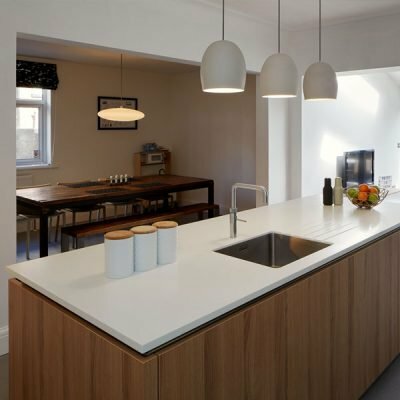 Corian tops with seamless joints to gable ends matched the handleless doors and helped achieve the overall minimalist look requested.